Alliance and Leicester make a smooth leadership transition. Insider David Bennett will replace Richard Pym as CEO next month. The move is accompanied by good profit forecasts. The absence of turbulence suggests that the company is under no pressure to signal any change of strategic direction. David Bennett, Group Finance Director of Alliance & Leicester plc, will become the company’s Group Chief Executive with effect from 27 July 2007. This follows the announcement in February that Richard Pym, Group Chief Executive, had asked the Board to consider his successor, resulting in an extensive search process which considered a range of internal and external candidates. The transition in leadership checks all the boxes for a company that is progressing nicely. No muscular interventions from stakeholders. Mr Pym, after five years at the helm announced as early as February that he was intending to stand down, after leading the bank for five years. David Bennett had scored considerable brownie points internally last year through his efforts which was seen as thwarting a possible takeover bid from Credit Agricole. Compare this to the difficulties that the Government had in achieving the transition from Tony Blair to Gordon Brown. Or compare it to the difficulties experienced by companies when a change of leader was forced on them by unwelcome pressures sometimes from outside the company, sometime from inside. We should not assume that A&L are blessed with a completely calm business environment. The BBC has been following news of the bank’s interest charges. Like other high-street lenders, it has had its share of adverse publicity. 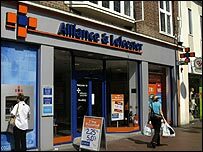 The Alliance & Leicester (A&L) bank has apologized for a letter sent to customers who are trying to reclaim overdraft charges ….In February, the Financial Ombudsman Service criticized the A&L for closing the accounts of some customers who were suing the group for excessive overdraft charges ..
Another signal of robust health? There are times when bad news can be read as good news. The rumbling stories of the nasty banks bullying their helpless customers have the effect of putting the institutions under the further scrutiny of financial journalists. Any evidence that a bank is in deeper trouble is likely to be revealed. So, to this outsider, A&L seem in good shape. The check-list seems a useful starting point for evaluating a company’s transition from one leader to the next. With a little more research, it could turn into a nice indicator of leadership transition. This is one indicator of a company’s financial prospects for the future. Which might just be factored in to a decision to buy or hold shares. On the other hand, there is plenty of evidence that investing to beat the market requires faith in more than a single indicator of corporate health. External ratings present a picture of a solid company with risks mainly around a major deterioration in the UK housing market. Less likely for the Alliance are risks associated with disruptive corporate innovation associated with change of strategy. You are currently browsing the archives for the Richard Pym category.